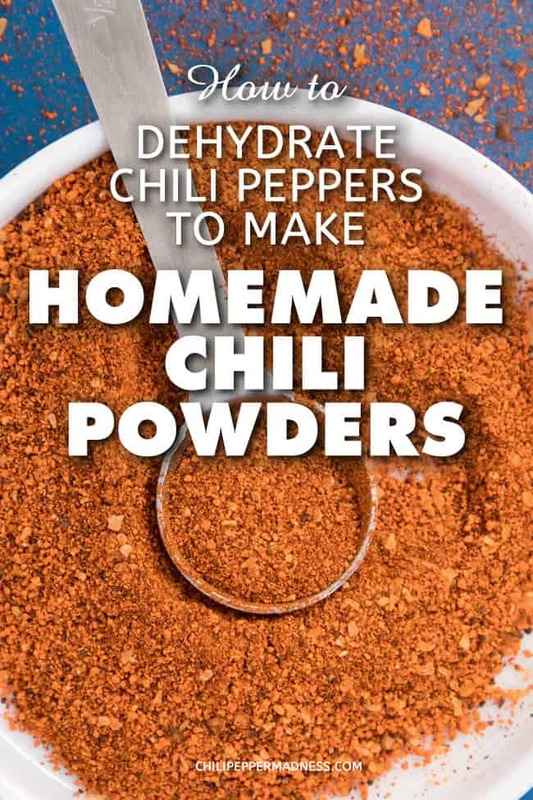 Learn how to dehydrate your chili peppers with a dehydrator and grind them into homemade chili powders. Here is the recipe method, from the author of “The Spicy Dehydrator Cookbook”. Dehydrating your chili pepper harvest is an excellent way to preserve your peppers. You can easily crush them or grind them into powders for use all year long. The method is very simple with a dehydrator. Check out the video below. What can you do with your dried chili peppers? First, wash and dry your chili peppers. Choose only fresh peppers. If they show any signs of rotting, throw them away. Next, wearing gloves, remove the stems and slice the thicker peppers into rings and thinner peppers in half. Leave them whole if you prefer, but they will take much longer to dehydrate. The gloves are important when working with peppers because the oils from the peppers can burn your skin, and the pain can linger. Place the peppers on the trays of the dehydrator. Spread them out evenly so the heat can distribute properly. Turn on the dehydrator at 135-140 degrees F, or whatever setting your dehydrator recommends. NOTE: I like to place my dehydrator in the garage because it will release fumes over time and you will notice the odor. Let the dehydrator sit anywhere from 5 hours to overnight. It will very likely take longer than 5 hours, but much depends on the thickness of the pepper walls and how many peppers you’re working with. I personally turn mine on when I go to bed and check it in the morning. The peppers are usually dried by morning, but if not, just leave them in longer until they are dried. Once they are dried, remove and grind them into a powder using a spice or coffee grinder. Strain out the powder and process the larger chunks until only chili powder remains. Also, the powders are quite fine and may get into the air if you are not working in a well ventilated room, so you may want to wear a mask and goggles. Superhot chili peppers, truly, are called superhots for a reason. 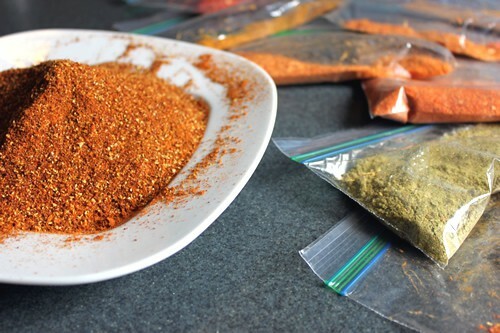 Store the chili powder in baggies or containers, or use as you wish. Keep it in a dark place, like your pantry, for freshness. How Much Chili Powder Comes from Fresh Peppers? 1 pound of fresh chili peppers will yield about 4 ounces dried pods. Ground down, it should yield 3/4 cup chili powder. These are the products that I use to dehydrate chili peppers and make blends, and I personally recommend them. They are affiliate links – just an FYI. If you use them, let me know if you have any questions and I can help. Email me anytime. Nesco Snackmaster Pro Food Dehydrator FD-75A – For Dehydrating peppers and other foods. Magic Bullet MBR-1701 17-Piece Express Mixing Set – For Grinding down the peppers for powders. How to Dehydrate Chili Peppers – A shorter video with a longer discussion on drying chili peppers in general. 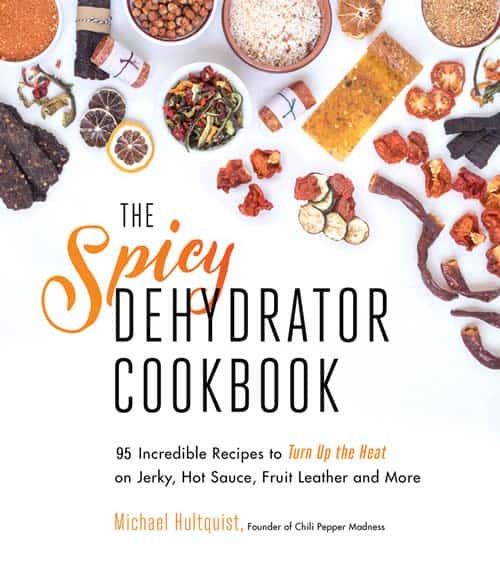 If you enjoy dehydrating chili peppers and other foods, I hope you will check out my cookbook, “The Spicy Dehydrator Cookbook“. 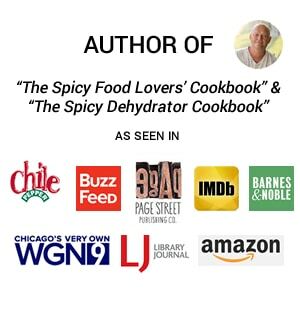 It is filled with recipes, information and techniques for making not only homemade chili powders and other spice blends, but recipes for making jerky, fruit and hot sauce leathers, healthy snacks, entire meals and so much more. Learn how to dehydrate your chili peppers with a dehydrator and grind them into homemade chili powders. Here is the recipe method. Wash and dry your chili peppers. Choose only fresh peppers. If they show any signs of rotting, throw them away. Wearing gloves, remove the stems and slice the thicker peppers into rings and thinner peppers in half. Leave them whole if you prefer, but they will take much longer to dehydrate. SEE NOTES. Once they are dried, remove and grind them with a spice grinder until they are a fine powder. Store the powders in baggies or containers, or use as you wish. Keep them in a dark place, like your pantry, for freshness. NOTE: I like to place my dehydrator in the garage because it will release fumes over time and you will notice the odor. Let the dehydrator sit anywhere from 5 hours to overnight. It will very likely take longer than 5 hours, but much depends on the thickness of the pepper walls and how many peppers you're working with. I personally turn mine on when I go to bed and check it in the morning. The peppers are usually dried by morning, but if not, just leave them in longer until they are dried. NOTE 2: The gloves are important when working with peppers because the oils from the peppers can burn your skin, and the pain can linger. Need help? How to Stop the Chili Pepper Burn On Your Skin. This post was updated on 8/28/18 to include new photos and recipe card. Originally posted on 4/14/14. My rating is actually just on dehydrating peppers period. 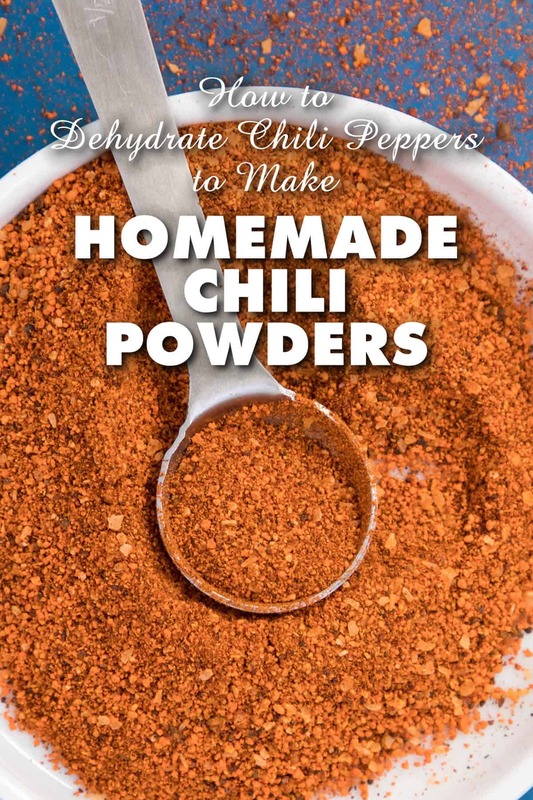 I have been doing it for years and make all my own chili powders. I have gotten so bad that I now have one dehydrator for peppers I smoke (like the red jalapeños currently being turned into chipotles as I type) and one for all other stuff. I live in Michigan and have NEVER had a crop of peppers like this; saw this site for some additional ideas on what to do with them! Habaneros, ghost, Serrano, jalapeños, cayenne, hot green chili..have made lots of jellies, powders, fermenting ghost for a hot sauce…thanks for all the other ideas I am finding! Thanks, Kathryn! I appreciate it! Hello. This is exactly the process that I have used for many years now. This season I have processed well over 300 large fruits, a combination of habaneros, carolina reapers, trinidad scorpions, and ghosts. I only have a few plants this year however the weather in eastern Iowa has been just about perfect for abundant growth. Sometimes I grind them in a blender too. Thanks for the great article. That’s great, Charlie. Thanks for commenting. Yes, I love this technique and am never wanting for seasoning blends. I love it! if you have joint pain , just rub a little oil on your hands after cutting your peppers & thenrub it on your joints to get the benefit of the capsacin . it helps relieve the pain. Thank you, Marshall. An interesting tip! Have you tried making powder from Chili Cobanero Pods? Rebecca, no, but the process would work for them the same. Let me know how it turns out for you. Love your site. I made your pineapple-habanero sauce the other day and it’s a big hit! This past weekend I smoked the last of the jalapenos and anaheims from my garden for 3 hours at 180 deg F, (split in half, seeds in). I then put the smoked peppers into the Nesco dehydrator (same model as your link above), which took up 3 of 5 trays. Surprisingly, it took 26 hours to dry the peppers in the dehydrator at 135 deg.F to the point where they snapped when bent. Maybe they were just thick-fleshed jalapenos??? Other than the smoked chili smell that permeated the house for the better part of 2 days, it was no big deal. I was just surprised how long it took… Anyway, thanks for sharing your wisdom and experiences! REPLY: Thanks, Matt! There are a number of factors that can affect your drying times, such as humidity levels, temps, pepper thickness, etc. I’ve had some batches take that long. Glad it worked out! — Mike from Chili Pepper Madness. Have you tried making powder with Carolina Reaper peppers? REPLY: Angela, yes, it works great. You can do this for any pepper. — Mike from Chili Pepper Madness. You’re going to want to invest in nitrile gloves and at least a mask, if not a full respirator and goggles when doing this to ghost, scorpion, etc. The powder from the spice grinder is very fine and gets into the air REALLY EASILY. Taking the lid off of the spice grinder releases some of the super fine particles into the air. You WILL be coughing and have burning nasal passages and eyes if you aren’t wearing protection! Yes, safety is very important when working with superhots. I always advise to wear gloves at a minimum. A simple mask is not a bad idea, or at least work in a well ventilated room. REPLY: Anthony, you can smoke them and then finish them in a dehydrator. That works well. They can be dried right in the smoker, but the dehydrator will work great. — Mike from Chili Pepper Madness. Mike, thanks for this inspiring and educational video. My wife is from Mexico and we live in the D.C. area where there are many Hispanic stores. In her country and our local stores they sell whole dried poblanos as ‘chili ancho’ with the seeds retained within. Do you think we could dry whole poblanos in the Nesco? REPLY: Thanks, John. Yes, you can dry whole poblanos, though it will take much longer. You might consider cutting slits into the sides to the air can move through more easily. They might have a hard time fitting in a Nesco, but you can do it. — Mike from Chili Pepper Madness. REPLY: Nice! I LOVE my Nesco. And my Excalibur. — Mike from Chili Pepper Madness. I am so glad I stumbled upon your site! VERY helpful, intellectual and fun to watch. Pluggin’ in the dehydrator right now for my first batches of Chocolate Habenero, Scorpion, Carolina Reapers, Habeneros and Jalepenos! Can’t wait to stock the pantry. After dehydrating and grinding the peppers, what can be used to prevent the powders from caking in the storage container?? I did the whole she-bang but i find the powder is almost immediately caking. Also, how long will the powders be good for? BTW, I did this process in very low humidity conditions. REPLY: Don, much of this has to do with moisture and humidity, though powders can cake up. You might try adding in a few grains of rice or beans to help soak up any excess moisture. The powders last indefinitely, but will lose potency over time. — Mike from Chili Pepper Madness. Should I let the peppers mature fully before trying to dry them? I have a Nesco, also, but wondered about air-drying some whole….. REPLY: Christy, it is best to let them mature for the overall flavor. — Mike from Chili Pepper Madness. So do you remove the seeds? Or do you make the powder with the seeds? REPLY: Annie, most of the seeds fall out after dehydration and fall to the bottom, but the seeds can be used in the powder, as long as they disintegrate enough. Everything that doesn’t grind down properly is sifted out. — Mike from Chili Pepper Madness. REPLY: I think it should be fine, Carolyn, though yes, you can try a food processor or blender to get a better consistency. Also, try a strainer to get out the larger bits if they bother you. — Mike from Chili Pepper Madness. I love that pile of chili peppers! I love real chili powders. Just started growing my own hot peppers last year and this year had a fair crop of Habs and Ghosts. I like the idea of dehydrating and turning into a powder to use. My question is for making hot sauces, it is better to use these powders or to use fresh or frozen pods? I’m trying to decide if I should preserve what I have by leaving them frozen or to dehydrate and powder. Thoughts – frozen whole or powder into recipes like your pineapple/mango ghost hot sauce? REPLY: Hey, John. Fresh is always best for hot sauces. You’ll get all the body of the pepper in the sauce. You CAN make sauces with powders, but then you’ll need other ingredients to fill out the sauce, like onions, fruits, etc. Also, you can certainly make sauces from frozen peppers. I hope this helps! — Mike from Chili Pepper Madness. Mike, can I dehydrate my jalapeños after they have been frozen. Thank you. REPLY: Fred, YES, you can dehydrate frozen peppers. Just thaw them first, though they could take longer. – Mike from Chili Pepper Madness. 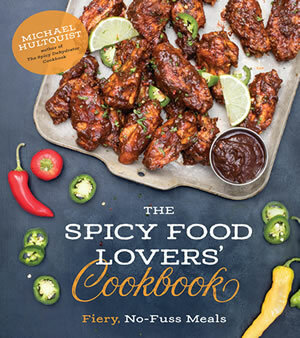 I am looking for any recipes using same for hot sauces so let’s trade?? don’t know if your offer is still in effect, but if so, I would like to get some seeds. I grow every kind of chile that I can find and would welcome the opportunity to try the Rocoto. Thanks for your consideration. Ann, yes, we use Thai peppers. You can search the site. You can certainly dehydrate them and turn them into powders as well. Do you ever do Thai chili peppers? We have a small crop of them this year. They were fun to grow but now we’re not sure just what to do with them! 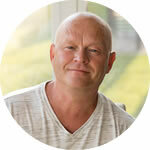 I bought a Nutribullet – the Magic Bullet’s new big brother – for just this purpose. The Nutris come in 600 watt, 900 watt, and 1700 watt versions now, so they grind anything to fine powder much, much better than the old Magic Bullet. I dehydrate and make make lots of my own powders mixes like chili powders, onion powder, garlic powder and tomato powder, which is SOOO much better to have than tomato paste.